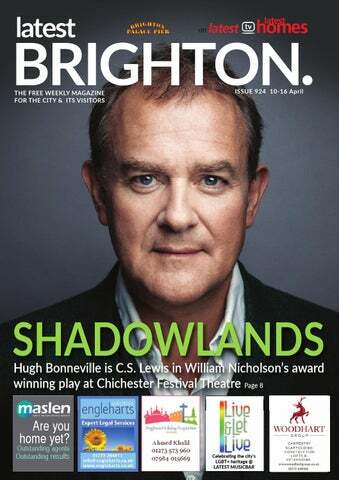 SHADOWLANDS Hugh Bonneville is C.S. Lewis in William Nicholson’s award winning play at Chichester Festival Theatre Page 8 Are you home yet? recognition is an independent science fiction feature film created by filmmakers from Ascot, Surrey. The film was selected to be a part of several festivals including London Sci-fi and Other Worlds Austin. Among the cast are Adam J Bernard (Dreamgirls) and Hattie Gotobed (Game of Thrones). The story is set in the near future, a man experiences terrifying visions of a past he can’t remember. His partner, who secretly works for a company that manipulates memory, attempts to uncover the mysteries surrounding them. One of the biggest challenges we faced making the film was creating a believable futuristic yet realistic world to tell the story with limited resources. There are over four hundred visual effects shots in the film and production took place over a three year period, beginning preproduction back in early 2016. Packages to suit all budgets, room for two to two hundred, great bars and staff, & a wide range of catering, music & entertainment options. t seems like no time since American Idiot came to rock the world of musical theatre but this new tour of Green Day's explosive rock musical, American Idiot marks the shows 10th anniversary and the 15th anniversary of the Grammy Award winning original album. The tour stars singer-songwriter Luke Friend (X-Factor), Tom Milner (The Voice, Waterloo Road) and introduces Sam Lavery as Whatsername. UP NORTH DOWN SOUTH OUR FRIENDS IN THE NORTH! liked Dean’s passion and cast him as the lead role of Trevor Wallis in Steve’s second feature Tears in the Dust, a gritty northern drama about homelessness. It was during that time Dean told Steve about an idea he had for a comedy and he pitched the script to Steve who loved it and decided to make it. It is hard to believe the two of them are now working on the third series. Viewers in Brighton will get to see just how crazy life Up North can be when Latest TV broadcast the 5 funny episodes from season 2. The first episode Wildlife Up North, sees an explosion in the pub and Mick blackmailing local taxi driver Patch Thatch into giving him 10 free taxi rides, since Patch was the one who started the fire by accident. Also the character Daft Dave gets a new job as a Zoo Keeper at Sheffield Zoo and gives Mick two free tickets... but disaster strikes when Dada the gorilla escapes from the zoo. Then the laughter continues with 4 more episodes including Fishing Up North and Dating Up North. TUESDAY APRIL 09, 2019 06:00 Cook It Andrew Kay presents the no frills and fun how to cookery programme to help you prepare really tasty, simple fresh food from good value produce for yourself, friends & family. 06:30 Cook It Andrew Kay presents the no frills and fun how to cookery programme to help you prepare really tasty, simple fresh food from good value produce for yourself, friends & family. 07:00 Carib-Asian Cookery Sherrie Eugene-Hart and Pat Hart blend an intoxicating infusion of Caribbean and Asian Food from recipes handed down by their parents. It’s a culinary cultural adventure. 07:30 Carib-Asian Cookery Sherrie Eugene-Hart and Pat Hart blend an intoxicating infusion of Caribbean and Asian Food from recipes handed down by their parents. It’s a culinary cultural adventure. 08:00 Homeless By The Sea The most talked about film ever shown on Latest TV. The first time ever rough sleepers and the homeless get their say! 09:00 Amy Winehouse Her Legacy An inside look at the Amy Winehouse Foundation, and the legacy she left. 10:00 Melody Club 1949. Comedy. A nitwit investigator (Terry Thomas) goes undercover in a restaurant to catch a gang of crooks. 11:15 The Chair Jez Kay invites a local Brighton personality into the studio for an in-depth and revealing chat. This episode's interviewee is Andrew Kay. 11:30 Cook It Andrew Kay presents the no frills and fun how to cookery programme to help you prepare really tasty, simple fresh food from good value produce for yourself, friends & family. (S1, E11) 12:00 Henry Normal... ...Staring Directly at the Eclipse. A very personal film following poet and writer Henry Normal as he performs around the country and talks lovingly about his family, wife and son. 13:00 Eva's World: Pride and Prejudice Brighton's open minded gender and sexual identities examined by Homeless-By-The-Sea director Eva Marie Wilshere. Should LGBTQIA have a P added? 14:00 Bundle Of Joy 1956. Musical Comedy. After being fired from her job, Polly (Debbie Reynolds) finds an abandoned baby. People believe the baby is hers. Directed by Norman Taurog. Starring Eddie Fisher. 16:00 Curse of the Wraydons 1946. Horror. A young captain, after participating in a duel, becomes the suspect in a series of killings near Epping Forest. Directed by Victor M Gover. Starring Tod Slaughter & Bruce Seton. 17:45 The Chair Jez Kay invites a local Brighton personality into the studio for an in-depth and revealing chat. 18:00 Latest News The latest news where we are - plus all the sport from Brighton and the surrounding area. 18:30 Queer Say Andrew Kay's look at LGBT news and media from around the world with the help of his studio guest. 19:00 Best of Brighton Lights Richard Shayler takes a cheeky look back at Latest TV's magazine programme Brighton Lights. 19:30 Exceptional Homes Beautiful million-pound-plus properties in the greater Brighton and Sussex area. 20:00 Latest News The latest news where we are - plus all the sport from Brighton and the surrounding area. 20:30 Meet The Michaels The Brighton family that star in Gogglebox. Father and son story, where dad likes Eastbourne Pier and son Louis likes Brighton Palace Pier. 21:00 AK Souffle Andrew Kay introduces special guests in this LGBT-focused chat show. 21:30 The Treason Show Be entertained by Good Morning Britain, Putin and Trump, Arlene Foster and more in this satirical show by Mark Brailsford and co. 22:00 Live From The Roadee Showcasing the best in local Brighton music, all recorded in the Roadee - a mobile recording studio. 22:30 Up North Two neighbours show us how society works up north. 23:00 Eva's World: Pride and Prejudice Brighton's open minded gender and sexual identities examined by Homeless-By-The-Sea director Eva Marie Wilshere. Should LGBTQIA have a P added? 00:00 Latest News The latest news where we are - plus all the sport from Brighton and the surrounding area. 00:30 Chewing the Cud LQBTQ+ interest magazine show. The latest in showbiz news, social trends, and special guests to chat to. 01:30 Queer Say Andrew Kay's look at LGBT news and media from around the world with the help of his studio guest. 02:00 Latest News The latest news where we are - plus all the sport from Brighton and the surrounding area. 02:30 The Treason Show Be entertained by Good Morning Britain, Putin and Trump, Arlene Foster and more in this satirical show by Mark Brailsford and co. 03:00 Live From The Roadee Showcasing the best in local Brighton music, all recorded in the Roadee - a mobile recording studio. 03:30 Up North Two neighbours show us how society works up north. 04:00 Eva's World: Pride and Prejudice Brighton's open minded gender and sexual identities examined by Homeless-By-The-Sea director Eva Marie Wilshere. Should LGBTQIA have a P added? 05:00 The Donald Trump Show The 45th President of the United States of America as you've never seen him before. With special guests Miss Brighton and Bill Smith. 05:30 Meet The Michaels The Brighton family that star in Gogglebox. Father and son story, where dad likes Eastbourne Pier and son Louis likes Brighton Palace Pier. WEDNESDAY APRIL 10 06:00 The Non-League Football Show All the latest non-league football news and action from around the region. 07:00 From Hereford to Here Attila on the Albion. Brighton fan Attila the Stockbroker chats to guests about the Seagulls and all things football. 07:30 From Hereford to Here Attila on the Albion. Brighton fan Attila the Stockbroker chats to guests about the Seagulls and all things football. 08:00 Homeless By The Sea The most talked about film ever shown on Latest TV. The first time ever rough sleepers and the homeless get their say! 09:00 Paradise Lost We take a look at Manchester's Gay Village at a pivotal time in its history. 10:00 A Tale of Five Cities 1951. Drama. Stars Bonar Colleano, Barbara Kelly, Eva Bartok & Gina Lollobrigida. When an Englishman leaves America to enlist in the RAF, his gruelling combat experiences result in a loss of memory. 11:30 From Hereford to Here Attila on the Albion. Brighton fan Attila the Stockbroker chats to guests about the Seagulls and all things football. 12:00 Henry Normal... ...Staring Directly at the Eclipse. A very personal film following poet and writer Henry Normal as he performs around the country and talks lovingly about his family, wife and son. 13:00 Eva’s World Pride and Prejudice The battle for LGBT rights is not won. Eva Marie Wilshere’s new film after her Homeless by The Sea documentary. 14:00 No Smoking 1955. Comedy directed by Henry Cass and starring Reg Dixon, Belinda Lee and Lionel Jeffries. A village chemist invents an anti-smoking tablet but the tobacco companies aren't happy. 15:30 Under Your Hat 1940. Comedy. To keep an eye on her secretagent husband (Jack Hulbert), Kay (Cicely Courtneidge) gets a job as a maid. 17:00 Walks Around Britain Series featuring inspirational walks from around Britain. Andrew White walks from Banavie to Gairlocky and around the Ribblehead Viaduct. 17:30 Walks Around Britain Series featuring inspirational walks from around Britain. Andrew White walks from Banavie to Gairlocky and around the Ribblehead Viaduct. 18:00 Latest News The latest news where we are - plus all the sport from Brighton and the surrounding area. 18:30 The Vote Mark Walker and guests from the world of politics discuss local and national issues. 19:00 Our Town Local history quiz testing contestants on their Brighton knowledge. 19:30 Brighton Wow Theres 111 places that will wow you in Brighton, as Prince Harry and Meghan found out, and Alexandra Loske wrote that hit book. Here’s the TV series. 20:00 Latest News The latest news where we are - plus all the sport from Brighton and the surrounding area. 20:30 Under the Radar Paul Mex and Jeff Hemmings show and discuss great music videos that may have been under your radar. 21:00 AK Souffle Andrew Kay introduces special guests in this LGBT-focused chat show. 21:30 Queer Say Andrew Kay's look at LGBT news and media from around the world with the help of his studio guest. 22:00 The Making of Epicene An inside look into the making of Epicene. 22:30 Hot Air Bill Smith let's off some hot air - laugh's from Latest TV's chief gag maker 23:00 Eva's World: Pride and Prejudice Brighton's open minded gender and sexual identities examined by Homeless-By-The-Sea director Eva Marie Wilshere. Should LGBTQIA have a P added? 00:00 Latest News The latest news where we are - plus all the sport from Brighton and the surrounding area. 00:30 The Vote Mark Walker and guests from the world of politics discuss local and national issues. 01:00 Our Town Local history quiz testing contestants on their Brighton knowledge. 01:30 Brighton Wow There's 111 places that will wow you in Brighton, as Prince Harry and Meghan found out, and Alexandra Loske wrote that hit book. Here's the TV series. 02:00 Latest News The latest news where we are - plus all the sport from Brighton and the surrounding area. 02:30 Under the Radar Paul Mex and Jeff Hemmings show and discuss great music videos that may have been under your radar. 03:00 AK Souffle Andrew Kay introduces special guests in this LGBT-focused chat show. 03:30 Queer Say Andrew Kay's look at LGBT news and media from around the world with the help of his studio guest. 04:00 The Making of Epicene An inside look into the making of Epicene. 04:30 Eva's World: Pride and Prejudice Brighton's open minded gender and sexual identities examined by Homeless-By-The-Sea director Eva Marie Wilshere. Should LGBTQIA have a P added? 05:30 Live From the Roadee Showcasing the best in local Brighton music, all recorded in the Roadee - a mobile recording studio. THURSDAY APRIL 11 06:00 For The Love Of Yoga Physical practice doesn't have to be strong, particularly when we are exhausted, have been injured or have a health condition. There will be a restorative practice, plus an interview with Emma Cole. 06:30 BollyHeat A fun and vibrant way to stay fit and healthy, with host Aruna Kailey you can learn fitness routines to many styles of asian music and Bollywood inspired influences. 07:00 Burn Up With Natalie Personal trainer Natalie Golland gives viewers a fitness workout. 07:30 For The Love Of Yoga A look at yoga and visualisation/meditative practices, using the breath and other tools. A grounding practice highlights the importance of the focus of our minds. Plus an interview with Bunmi Aboaba. 08:00 Who Are You Gonna Vote For? The run up to local elections. 09:00 Eva's World: Pride and Prejudice Brighton's open minded gender and sexual identities examined by Homeless-By-The-Sea director Eva Marie Wilshere. Should LGBTQIA have a P added? 10:00 The Big Game 1995. Drama starring Gary Webster and Chris Jury. Factory worker and fly-by-night Jimmy loves a little flutter so when he receives an 'open sesame' to a big bucks game, he can't resist. 12:00 Henry Normal... ...Staring Directly at the Eclipse. A very personal film following poet and writer Henry Normal as he performs around the country and talks lovingly about his family, wife and son. 13:00 Who Are You Gonna Vote For? The run up to local elections. 14:00 Melody Club 1949. Comedy. A nitwit investigator (Terry Thomas) goes undercover in a restaurant to catch a gang of crooks. 15:15 Bundle Of Joy 1956. Musical Comedy. After being fired from her job, Polly (Debbie Reynolds) finds an abandoned baby. People believe the baby is hers. Directed by Norman Taurog. Starring Eddie Fisher. 17:15 The Chair Jez Kay invites a local Brighton personality into the studio for an in-depth and revealing chat. 17:30 Walks Around Britain Series featuring inspirational walks from around Britain. Andrew White walks from Banavie to Gairlocky and around the Ribblehead Viaduct. 18:00 Latest News The latest news where we are - plus all the sport from Brighton and the surrounding area. 18:30 The People's Republic... ...of Brighton and Hove. An isle of sanity in a sea of blue. 19:00 Extra Ordinary People Yael Breuer meets the most amazing people. This month amongst others Niklas Frank son of Nazi Leader repudiates his father. 19:30 Meet The Michaels The Brighton family that star in Gogglebox. Father and son story, where dad likes Eastbourne Pier and son Louis likes Brighton Palace Pier. 20:00 Latest News The latest news where we are - plus all the sport from Brighton and the surrounding area. 20:30 The People's Republic... ...of Brighton and Hove. An isle of sanity in a sea of blue. 21:00 Shorts Out Deborah Espect introduces short films about the LGBT world. 22:00 The Baba Brinkman Show Special series featuring the Canadian rapper, best known for his Peer Reviewed Rap that fuses the music with literature, theatre, and science. 22:30 Up North Two neighbours show us how society works up north. 23:00 Eva's World: Pride and Prejudice Brighton's open minded gender and sexual identities examined by Homeless-By-The-Sea director Eva Marie Wilshere. Should LGBTQIA have 00:00 Latest News The latest news where we are - plus all the sport from Brighton and the surrounding area. 00:30 The People's Republic... ...of Brighton and Hove. An isle of sanity in a sea of blue. 01:00 Extra Ordinary People Yael Breuer meets the most amazing people. This month amongst others Niklas Frank son of Nazi Leader repudiates his father. 01:30 Meet The Michaels The Brighton family that star in Gogglebox. Father and son story, where dad likes Eastbourne Pier and son Louis likes Brighton Palace Pier. 02:00 Latest News The latest news where we are - plus all the sport from Brighton and the surrounding area. 02:30 The People's Republic... ...of Brighton and Hove. An isle of sanity in a sea of blue. 03:00 Shorts Out Deborah Espect introduces short films about the LGBT world. 04:00 The Baba Brinkman Show Special series featuring the Canadian rapper, best known for his Peer Reviewed Rap that fuses the music with literature, theatre, and science. 04:30 Up North Two neighbours show us how society works up north. 05:00 Eva's World: Pride and Prejudice Brighton's open minded gender and sexual identities examined by Homeless-By-The-Sea director Eva Marie Wilshere. Should LGBTQIA have a P added? FRIDAY APRIL 12 06:00 Exceptional Homes Beautiful million-pound-plus properties in the greater Brighton and Sussex area. 06:30 Exceptional Homes Beautiful million-pound-plus properties in the greater Brighton and Sussex area. 07:00 Millionaires' Row From penthouse to pool, take an exclusive tour of exceptional, outstanding, and unique dream houses. 07:30 Millionaires' Row From penthouse to pool, take an exclusive tour of exceptional, outstanding, and unique dream houses. 08:00 Valley Gardens The full story of the hottest political issue in Brighton. The future of the city is at stake. Will it be Happy Valley or... 09:00 Who Are You Gonna Vote For? The run up to local elections. 10:00 Curse of the Wraydons 1946. Horror. A young captain, after participating in a duel, becomes the suspect in a series of killings near Epping Forest. Directed by Victor M Gover. Starring Tod Slaughter & Bruce Seton. 11:45 The Chair Jez Kay invites a local Brighton personality into the studio for an in-depth and revealing chat. 12:00 Henry Normal... ...Staring Directly at the Eclipse. A very personal film following poet and writer Henry Normal as he performs around the country and talks lovingly about his family, wife and son. 13:00 Who Are You Gonna Vote For? The run up to local elections. 14:00 A Tale of Five Cities 1951. Drama. Stars Bonar Colleano, Barbara Kelly, Eva Bartok & Gina Lollobrigida. When an Englishman leaves America to enlist in the RAF, his gruelling combat experiences result in a loss of memory. 15:30 No Smoking 1955. Comedy directed by Henry Cass and starring Reg Dixon, Belinda Lee and Lionel Jeffries. A village chemist invents an anti-smoking tablet but the tobacco companies aren't happy. 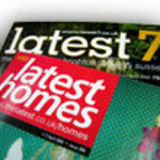 17:00 Exceptional Homes Beautiful million-pound-plus properties in the greater Brighton and Sussex area. 17:30 Exceptional Homes Beautiful million-pound-plus properties in the greater Brighton and Sussex area. 18:00 Latest News The latest news where we are - plus all the sport from Brighton and the surrounding area. 18:30 The Gulldashians The seagull reality show that doesn't star Stephen Seagull or Jean Paul Gulltier but does star Migull Bay and young talented Longhill actors. 19:00 From Hereford to Here Attila on the Albion. Brighton fan Attila the Stockbroker chats to guests about the Seagulls and all things football. 19:30 Brighton Wow Theres 111 places that will wow you in Brighton, as Prince Harry and Meghan found out, and Alexandra Loske wrote that hit book. Here’s the TV series. 20:00 Latest News The latest news where we are - plus all the sport from Brighton and the surrounding area. 20:30 Life After Masterchef Latest TV follows Masterchef winner Steven Edwards' journey to starting his own restaurant in Brighton. 21:00 Lulu Belle 1948. Musical Drama. Lulu Belle (Dorothy Lamour), a small-time singer and voracious man-eater with a sordid past, sings in a cheap dive in Natchez, Mississippi, in the early 1900s. 22:30 Big Brighton Film Challenge A special roundup of some of the best entries from this year's competition, showcasing some of the biggest and best short films in Brighton and Hove. 23:00 Precognition Teenage Sci-Fi adventure. 01:00 Valley Gardens The full story of the hottest political issue in Brighton. The future of the city is at stake. Will it be Happy Valley or... 02:00 Big Brighton Film Challenge A special roundup of some of the best entries from this year's competition, showcasing some of the biggest and best short films in Brighton and Hove. 02:30 Life After Masterchef Latest TV follows Masterchef winner Steven Edwards' journey to starting his own restaurant in Brighton. 03:00 Latest News The latest news where we are - plus all the sport from Brighton and the surrounding area. 03:30 Hot Air Bill Smith let's off some hot air - laugh's from Latest TV's chief gag maker 04:00 From Hereford to Here Attila on the Albion. Brighton fan Attila the Stockbroker chats to guests about the Seagulls and all things football. 04:30 Brighton Wow Theres 111 places that will wow you in Brighton, as Prince Harry and Meghan found out, and Alexandra Loske wrote that hit book. Here’s the TV series. 05:00 Latest News The latest news where we are - plus all the sport from Brighton and the surrounding area. 02:00 Big Brighton Film Challenge A special roundup of some of the best entries from this year's competition, showcasing some of the biggest and best short films in Brighton and Hove. 02:30 Our Town Local history quiz testing contestants on their Brighton knowledge. 03:00 Latest News The latest news where we are - plus all the sport from Brighton and the surrounding area. 03:30 Hot Air Bill Smith let's off some hot air - laugh's from Latest TV's chief gag maker 04:00 Best of Brighton Lights Richard Shayler takes a cheeky look back at Latest TV's magazine programme Brighton Lights. 04:30 The Gulldashians The seagull reality show that doesn't star Stephen Seagull or Jean Paul Gulltier but does star Migull Bay and young talented Longhill actors. 05:00 Latest News The latest news where we are - plus all the sport from Brighton and the surrounding area. 05:30 The People's Republic... SUNDAY APRIL 14 06:00 Family. Faith And Fun Sarah Hopwood presents the happiness debate, a show looking at a different emotion every week and how it relates to family life, the Christian faith, and a sense of fun. 06:30 Walks Around Britain Series featuring inspirational walks between 2-8 miles around Britain. Andrew White takes a challenging walk up Silver How in the Lake District & Leah walks through Fishlake in Yorkshire. 07:00 Bookenders Laura Lockington is joined by authors Mark Haysom ('Love, Love Me Do') and Susan Wilkins ('The Informant', 'The Killer'). 07:30 Bookenders Laura Lockington meets authors Sally O'Reilly (historical novel 'Dark Aemilia') and Simon Toyne (conspiracy thriller 'The Sanctus Trilogy'). 08:00 Who Are You Gonna Vote For? The run up to local elections. 09:00 Valley Gardens The full story of the hottest political issue in Brighton. The future of the city is at stake. Will it be Happy Valley or... 10:00 Family. Faith And Fun Sarah Hopwood presents the happiness debate, a show looking at a different emotion every week and how it relates to family life, the Christian faith, and a sense of fun. 10:30 Bundle Of Joy 1956. Musical Comedy. After being fired from her job, Polly (Debbie Reynolds) finds an abandoned baby. People believe the baby is hers. Directed by Norman Taurog. Starring Eddie Fisher. 12:30 The Vote Mark Walker and guests from the world of politics discuss local and national issues. 13:00 The Vote Mark Walker and guests from the world of politics discuss local and national issues. 13:30 The People's Republic... ...of Brighton and Hove. An isle of sanity in a sea of blue. 14:00 Curse of the Wraydons 1946. Horror. A young captain, after participating in a duel, becomes the suspect in a series of killings near Epping Forest. Directed by Victor M Gover. Starring Tod Slaughter & Bruce Seton. 15:45 A Tale of Five Cities 1951. Drama. Stars Bonar Colleano, Barbara Kelly, Eva Bartok & Gina Lollobrigida. When an Englishman leaves America to enlist in the RAF, his gruelling combat experiences result in a loss of memory. 17:15 The Chair Jez Kay invites a local Brighton personality into the studio for an in-depth and revealing chat. 17:30 Walks Around Britain Series following Andrew White, as he takes walks between 2-8 miles around every part of the UK. 18:00 Latest News The latest news where we are - plus all the sport from Brighton and the surrounding area. 18:30 Family. Faith And Fun Sarah Hopwood presents the happiness debate, a show looking at a different emotion every week and how it relates to family life, the Christian faith, and a sense of fun. 19:00 Homeless By The Sea The most talked about film ever shown on Latest TV. The first time ever rough sleepers and the homeless get their say! 20:00 Latest News The latest news where we are - plus all the sport from Brighton and the surrounding area. 20:30 Extra Ordinary People Yael Breuer meets the most amazing people. This month amongst others Niklas Frank son of Nazi Leader repudiates his father. 21:00 Lulu Belle 1948. Musical Drama. Lulu Belle (Dorothy Lamour), a small-time singer and voracious man-eater with a sordid past, sings in a cheap dive in Natchez, Mississippi, in the early 1900s. 22:30 Brighton Wow There's 111 places that will wow you in Brighton, as Prince Harry and Meghan found out, and Alexandra Loske wrote that hit book. Here's the TV series. 23:00 Shorts Out Deborah Espect introduces short films about the LGBT world. 00:00 Precognition Teenage Sci-Fi adventure. 02:00 Latest News The latest news where we are - plus all the sport from Brighton and the surrounding area. 02:30 Family. Faith And Fun Sarah Hopwood presents the happiness debate, a show looking at a different emotion every week and how it relates to family life, the Christian faith, and a sense of fun. 03:00 Shorts Out Deborah Espect introduces short films about the LGBT world. 04:00 Latest News The latest news where we are - plus all the sport from Brighton and the surrounding area. 04:30 Walks Around Britain Series featuring inspirational walks between 2-8 miles from around Britain. Andrew walks part of the Isle of Wight Coastal Path & between Huggate & Thixendale on the Yorkshire Wolds Way. 05:00 Extra Ordinary People Yael Breuer meets the most amazing people. This month amongst others Niklas Frank son of Nazi Leader repudiates his father. 05:30 Brighton Wow Theres 111 places that will wow you in Brighton, as Prince Harry and Meghan found out, and Alexandra Loske wrote that hit book. Here’s the TV series. MONDAY APRIL 15, 06:00 Walks Around Britain Series following Andrew White, as he takes walks between 2-8 miles around every part of the UK. 06:30 Walks Around Britain Series following Andrew White, as he takes walks between 2-8 miles around every part of the UK. 07:00 Bookenders Stephanie Lam talks about her novel 'The Mysterious Affair at Castaway House' and Laura Lockington meets bestselling writer Joanna Rees. 07:30 Bookenders Laura Lockington is joined by authors Sarah Rayner ('Another Night, Another Day') and Mark A Radcliffe ('Stranger Than Kindness'). 08:00 Homeless By The Sea The most talked about film ever shown on Latest TV. The first time ever rough sleepers and the homeless get their say! 09:00 Valley Gardens The full story of the hottest political issue in Brighton. The future of the city is at stake. Will it be Happy Valley or... 10:00 Under Your Hat 1940. Comedy. To keep an eye on her secretagent husband (Jack Hulbert), Kay (Cicely Courtneidge) gets a job as a maid. THE BIG BRIGHTON STORIES AT BREAKFAST & LUNCH EVERY DAY! 11:30 Walks Around Britain Series following Andrew White, as he takes walks between 2-8 miles around every part of the UK. 12:00 Henry Normal... ...Staring Directly at the Eclipse. A very personal film following poet and writer Henry Normal as he performs around the country and talks lovingly about his family, wife and son. 13:00 Eva's World: Pride and Prejudice Brighton's open minded gender and sexual identities examined by Homeless-By-The-Sea director Eva Marie Wilshere. Should LGBTQIA have a P added? 14:00 The Big Game 1995. Drama starring Gary Webster and Chris Jury. Factory worker and fly-by-night Jimmy loves a little flutter so when he receives an 'open sesame' to a big bucks game, he can't resist. 16:00 Melody Club 1949. Comedy. A nitwit investigator (Terry Thomas) goes undercover in a restaurant to catch a gang of crooks. 17:15 The Chair Jez Kay invites a local Brighton personality into the studio for an in-depth and revealing chat. This episode's interviewee is Rob Starr. 17:30 Walks Around Britain Series featuring inspirational walks from around Britain. Andrew White walks from Banavie to Gairlocky and around the Ribblehead Viaduct. 18:00 Latest News The latest news where we are - plus all the sport from Brighton and the surrounding area. 18:30 The Vote Mark Walker and guests from the world of politics discuss local and national issues. 19:00 Our Town Local history quiz testing contestants on their Brighton knowledge. 19:30 Life After Masterchef Latest TV follows Masterchef winner Steven Edwards' journey to starting his own restaurant in Brighton. 20:00 Latest News The latest news where we are - plus all the sport from Brighton and the surrounding area. 20:30 Bookenders Laura Lockington is joined by authors A K Benedict ('The Beauty of Murder') and illustrator, photographer, comic book artist, graphic designer, filmmaker and musician Dave McKean. 21:00 Tales From the Margins Extra Professor Rainer Schulze presents a series of films looking at issues affecting LGBT+ people around the world. 22:00 Hot Air Bill Smith let's off some hot air - laugh's from Latest TV's chief gag maker 22:30 The Treason Show Be entertained by Good Morning Britain, Theresa May, Putin and Trump, Arlene Foster and more in this satirical show by Mark Brailsford and co. 23:00 The Donald Trump Show The 45th President of the United States of America as you've never seen him before. With special guests Miss Brighton and Bill Smith. 23:30 Live From The Roadee Showcasing the best in local Brighton music, all recorded in the Roadee - a mobile recording studio. 00:00 Latest News The latest news where we are - plus all the sport from Brighton and the surrounding area. 00:30 The Vote Mark Walker and guests from the world of politics discuss local and national issues. 01:00 Our Town Local history quiz testing contestants on their Brighton knowledge. 01:30 Life After Masterchef Latest TV follows Masterchef winner Steven Edwards' journey to starting his own restaurant in Brighton. 02:00 Latest News The latest news where we are - plus all the sport from Brighton and the surrounding area. 02:30 Bookenders Laura Lockington is joined by authors A K Benedict ('The Beauty of Murder') and illustrator, photographer, comic book artist, graphic designer, filmmaker and musician Dave McKean. 03:00 Tales From the Margins Extra Professor Rainer Schulze presents a series of films looking at issues affecting LGBT+ people around the world. 04:00 Hot Air Bill Smith let's off some hot air - laugh's from Latest TV's chief gag maker 04:30 The Treason Show Be entertained by Good Morning Britain, Theresa May, Putin and Trump, Arlene Foster and more in this satirical show by Mark Brailsford and co. 05:00 The Donald Trump Show The 45th President of the United States of America as you've never seen him before. With special guests Miss Brighton and Bill Smith. 05:30 Live From The Roadee Showcasing the best in local Brighton music, all recorded in the Roadee - a mobile recording studio. 2 for 1 RIDES WRISTBANDS KIDS EAT FREE in PALM COURT RESTAURANT & LOTS MORE THROUGHOUT THE YEAR! COLLECT YOUR CARDS FROM VICTORIA’S BAR OR THE DOME ARCADE COFFEE SHOP!